Take a look at the credit lines in this exhibition, and you will see names that have been forever added to the permanent roster of our history. Without the crucial support of these most recent donors, Museum simply could not move forward, and we warmly thank all of our dedicated philanthropists for building a future worth remembering. “Many years ago, while I was sketching the interior garden of this Mission, some of the priests watched me while I painted. One of them was a bent old man. 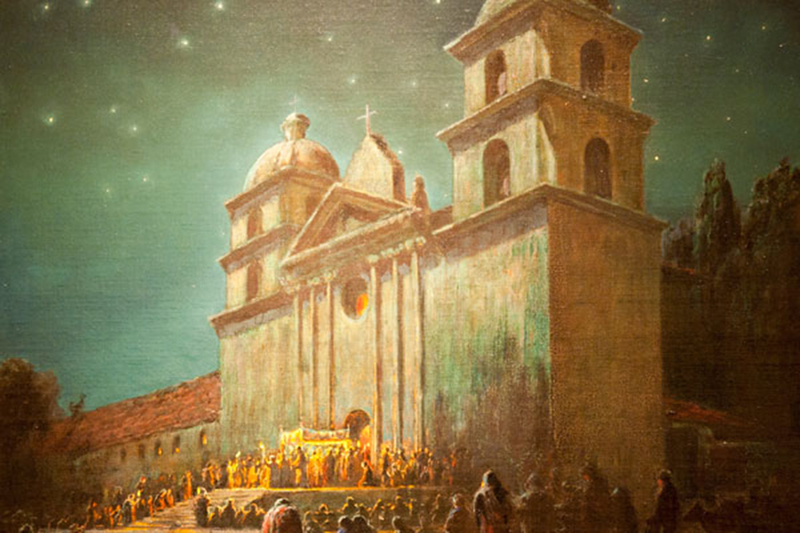 He was in a reminiscent mood, and desribed a ceremony in the 1860’s when he was visiting the Mission with some of the fraters from Capistrano. Dentzel Steam & Horsepower Carousel Mfg. Co.
For many of us, the scramble to select a carousel animal, followed by the thrill of grasping for a brass ring to the sound of a Wurlitzer orchestrion, was an exhilarating and unforgettable childhood experience. These popular carousel rides were introduced to amusement parks across America by Gustav Dentzel in 1867. Ironically horse-driven at first, Dentzel Carousels were later powered by steam, and then electricity, with some models up to 54 feet in diameter. All were decorated from the “Dentzel Menagerie,” a fanciful group of hand carved animals that represented species from the horse and rabbit to the Hippocampus of Roman mythology. On display here is a wonderful example of an inside-row prancer horse, complete with original paint and glass eyes. Mariano Guadalupe Vallejo (1808-1890) was the last commanding general of Alta California under Mexican rule. Born and raised in Monterey, he founded the settlement of Sonoma as military director of colonization. General Vallejo then distinguished himself during Americanization as a delegate to the California Constitutional Convention in 1849, and as one of the state’s first senators in 1850. This bench was once owned by Vallejo, and purchased from his Lachryma Montis estate in Sonoma by the donor in 1950. Gift of Judith Venegas Murphy and Lewis Venegas, Jr. The Spanish were introduced to the magnificently embroidered Chinese silk mantones, or shawls, while trading in the Philippines. As these mantones became popular in Spain’s royal court and high society, their popularity quickly passed into the Spainish colonies, and in Alta California, the brilliantly colored flower motif became the style of choice. The square mantón was worn folded into a triangle and used as a wrap, both indoors and out, and never as a dancing costume as some would believe. This particular mantón is of special interest, as it was owned by Victoria Cota, Guadalupe Cota-Bisol, and Regina Bisol-Venegas of Santa Barbara. Early in the morning of January 14th 1848 on his first commanding voyage, a nightmare awoke Captain Charles Porter Low. The captain decided to check the barometer, which had dropped significantly, and he hastily ordered the crew to prepare for a storm. As the sails were reefed and furled just south of the Cape of Good Hope, the Houqua ran directly into a hurricane, and in a matter of minutes, every sail was ripped to shreds, the top gallant masts were snapped, and the bowsprit broken off. A series of thirty foot spoon drift waves then rocked the Houqua against her beam ends, and Low was thrown over the side. On his way into the sea, Low somehow managed to grab hold of a line and pull himself back onto deck, whereupon he ordered the mainmast rigging cut, and the Houqua ultimately saved. After a successful twenty-five year career in command of clipper ships such as the Houqua, the N.B. Palmer, and the Samuel Russell, Captain Charles Porter Low retired to the first home built on Santa Barbara’s Mesa in 1873.